I remember asking dad about Castro when I was about 9 years old. I asked, “Is Castro a good guy or bad?” Dad said he couldn’t tell!! This was about 1955. We were living in Louisiana at the time. Dad was in the army there. Cuba was fairly close and in the news a lot. The Cubans were asking the same question! Ike was president. This past July, we had the pleasure of sharing a summer barbecue with a refugee from Cuba. Our dinner conversation was starkly different than most. This refugee came to the United States as a young boy in the early 1960s. His family was more fortunate than most as they were able to bring a suitcase and $100 when they fled Castro’s newly formed revolutionary paradise. Our dinner consisted of all-American fare: hamburgers, potato salad, watermelon and fresh ears of sweet corn. This is a menu shared with family and friends nationwide, while celebrating the birth of our beloved America on the Fourth of July. We began with a simple discussion about our country and the direction it has taken since Barack Obama came to power. We shared the usual complaints about the sour economy and liberal social engineering emanating from the rulers in Washington. The lesson learned from this discussion is a lesson most Americans refuse to hear. Political leaders can lie about their agenda and once in office they can take totally unexpected turns. If you had asked us three years ago if we thought General Motors would be nationalized, we would have never believed it. We could never contemplate a country where the rule of law, the most fundamental building block of a justice society would be evaporating just like it did in Castro’s Cuba in the early 1960s. But the news of injustice keeps increasing. Black Panthers are not charged with wrongdoing by the U.S. Department of Justice because their crimes are against whites. The bondholders of GM are stripped of their assets without due process by the government. Governmental leaders are bribed in full daylight only to have all investigation of the crimes stifled by the Attorney General. The U.S. borders are overrun with crime and illegal activity and the leaders in D.C. act as if it is important to protect the lawbreakers while the innocent are killed and overrun. When local communities attempt to enforce the law, they are ridiculed and threatened as racists and bigots. They are sued by the very administration entrusted with enforcing the law. Without the rule of law the U.S. Constitution is a sham. Without the rule of law our beloved America is swiftly becoming a country where only the well connected and politically powerful will be safe. As Michelle Malkin has so eloquently explained in her recent book, a culture of corruption has replaced honest government. The only way this problem will be fixed is by massive citizen action. All honest citizens that want to be treated equally must come together and demand that the favoritism, the bribes, the uneven enforcement of law end now. And yes, it can happen here. And may God save the United States of America! Does anyone read the U.S. Constitution these days? This was sent to me by a fellow Oath Keeper, who lives in Maine near the Canadian border. U.S. Constitution saves the day! Why won’t the feds read the constitution before they file a lawsuit against a sovereign state? In a stunning development that could potentially send the nation into a Constitutional crisis, an astute attorney who is well-versed in Constitutional law states that the ruling against the state of Arizona by Judge Susan Bolton concerning its new immigration law is illegal. 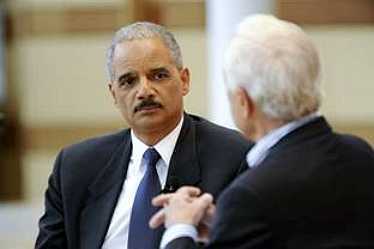 The inept U.S. Attorney-General Eric Holder. The attorney in question submitted her assertion in a special article in the Canada Free Press. Her argument states in part, “Does anyone read the U.S. Constitution these days? American lawyers don’t read it. Federal Judge Susan R. Bolton apparently has never read it. Same goes for our illustrious Attorney General Eric Holder. But this lawyer has read it and she is going to show you something in Our Constitution which is as plain as the nose on your face. In other words, the Judge in the Arizona case has absolutely no Constitutional jurisdiction over the matter upon which she ruled. As the Constitution makes abundantly clear, only the U.S. Supreme Court can issue rulings that involve a state. This means that neither Judge Bolton nor the 9th Circuit Court of Appeals in San Francisco, to which the case is being appealed, have any legal standing whatsoever to rule on the issue. Thus, U.S. Attorney-General Eric Holder filed the federal government’s lawsuit against the state of Arizona in a court that has no authority to hear the case. The attorney whose heads-up thinking concerning the Constitution provides the legal remedy for dealing with this blatant disregard for Constitutional law in the article at Canada Free Press. In a related development, another explosive discovery was made by those who actually take the Constitution seriously. The Constitution specifically allows an individual state to wage war against a neighboring country in the event of an invasion, should there be a dangerous delay or inaction on the part of the Federal Government. This information was cited by United Patriots of America. No one who is actually familiar with the crisis at the southern border can deny that Arizona is endangered by the relentless assault of lawless Mexican invaders who ignore our laws, inundate our schools and medical facilities with unpaid bills, and even endanger the very lives of citizens with criminal drug cartels that engage in kidnapping, murder, 115 bodies recovered in AZ entry routes, human trafficking, and other mayhem, including aiming missile and grenade launchers directly at U.S. border cities from just across the Mexican border. This is as much of an invasion as the nation of Iran sending in a fleet of warships to the Port of Charleston. The Constitution that forms the basis of the rule of law in this country says that Arizona has legal right to protect itself in the case of inaction or delay on the part of the federal government, including waging war in its self-defense. This, when coupled with the clear Constitutional mandate that only the Supreme Court hear cases involving the states, should be ample legal basis for attorneys representing Arizona to go after the federal government with a vengeance. Governor Jan Brewer and the stalwart members of the Arizona legislature have ample legal reason to stand firm against the illegal bullying of an arrogant, lawless federal government. This missive must be circulated around the USA; we must all get involved this is OUR case too.